메이크업을 손쉽게 지울 수 있는 클렌징워터 입니다. 클렌징 후에도 피부가 건조하지 않습니다. 2차 물세안이 추가로 필요 하지 않습니다. 간편한 펌프 타입으로 입구 부분을 솜으로 눌러 사용하세요. 사용방법메이크업을 지울때 제품을 깨끗한 솜에 적셔 닦아 사용하세요. 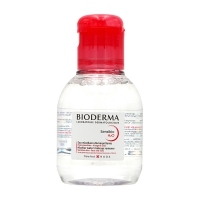 This gentle cleansing water efficiently cleanses and removes makeup, even eye makeup, without drying your skin. The instant you start applying the product to your face, your skin will feel instantly fresh and you’ll soon start to see a natural glow. 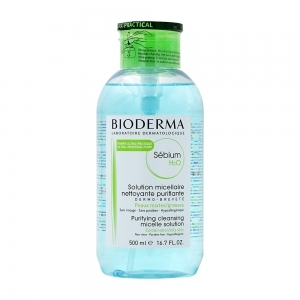 Bioderma Sebium H20 Purifying Cleansing Micelle Solution is the first cleansing water specifically for oily and acne-prone complexions. Its patented formula actually adjust the skin’s sebum amount, which prevents pores from getting clogged, so your skin clears and stays clear. It even gently exfoliates. It purifies the skin and generates sebium quality. Soak a cotton pad with S?bium H2O.Gently cleanse and/or remove make-up from your face.Re-apply until the cotton pad becomes clean.Lightly dab your face with a clean cotton towel. Aqua/Water/Eau, Peg-6 Caprylic/Capric Glycerides, Sodium Citrate, Zinc Gluconate, Copper Sulfate, Ginkgo Biloba Leaf Extract, Mannitol, Xylitol, Rhamnose, Fructooligosaccharides, Propylene Glycol, Citric Acid, Disodium Edta, Cetrimonium Bromide, Fragrance (Parfum). [Bi 442].